Jannatul Ferdoush Peya is a Bangladeshi actress and model who hails from Khulna. 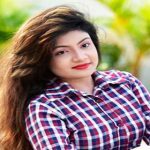 The heartthrob actress comes to the timeline around the showbiz industry of Bangladesh when appeared in the blockbuster movie ‘Chorabali’. She draws the attention of audience within very short time by her wonderful acting performance. Now Peya is a familiar face in the showbiz arena of the country who won the title of Miss Bangladesh 2007. Jannatul Ferdoush Peya was on October 14, 1991, in Khulna, Bangladesh. She brought up in the Khulna city. Her father is Mahmud Hasan Chowdhury and the mother is Mahbuba Chowdhury. She has a brother and two sisters in the family. Peya studied at Govt. Coronation Girls High School and completed SSC from the school. Then she moved to Dhaka with family pursue to become a lawyer. Then she admitted into London University to fulfill her childhood dream and achieved LLB degree. Now, the actress is interning under famous lawyer Dr. Kamal Hossain. Jannatul Ferdoush Peya kicked off the journey in the showbiz industry as a model. Always the actress gets media attention for her activities. She made her debut in the film industry with movie ‘Chorabali’ in 2012. In the movie, she appeared with Joya Ahsan, Shahiduzzaman Selim, Indraneil Sengupta and A.T.M. Shamsuzzaman. It was the blockbuster hit movie in the Dhallywood box office. In 2015, she appeared in the movie ‘Gangster Returns’ and ‘Probashir Prem’. Following the year, Peya acted in the movie ‘Chitmohol’. In 2017, she starred in the movie ‘Prem Ki Bujhini’. She is associated with social work with her friends through an organization named We Foundation. It is reported Jannatul Ferdoush Peya is romantically linked with Faruk Hasan Sameer.